(Newser) – The Netherlands' Bubb Kuyper auction house expected the eight-line poem on a piece of old paper to sell for thousands. They just didn't expect to go for $148,000. 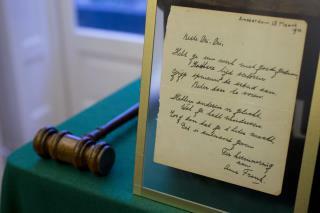 For that price, an anonymous bidder has become the owner of a poem signed by Anne Frank on March 28, 1942, reports the BBC; her family was forced into hiding in Amsterdam on July 6 of that year. The poem was initially sent to the older sister of one of Anne's friends, Jacqueline van Maarsen. However, van Maarsen says her sister, who died in 2006, gave it to her around 1970. According to the auction website, van Maarsen decided to sell the poem because "I know that my sister was not as attached to this verse." Indeed, she found it to have a "condescending tone," in the words of the New York Times. Is The Diary of Ann Frank still required reading in high school? If not, what has replaced it? (Anne Frank's marbles were found in 2014.) They'll never find Dubya's marbles. Not now. Not later.